Clothing is as important to the success of the shot as location, lighting and posing. We know that great images take time, patience and concentration. Our advice is to pick a style or a mood and focus on it. To many clothing and background changes leave little time to focus on what truly matters. Timeless clothing which is simple and classic will help your portrait stand the test of time. Keep your choices subtle and solid with everyone in the portrait wearing the same shade and “color family”. Work for balanced, harmony and color coordination. Most clients wear white shirts, this is not the most creative idea, but the most simple. For the look of the classic beach portrait everyone should dress in khaki pants, or blue jeans, solid color shorts or Capri’s. Young girls look beautiful with white dresses, and young men look smart with tans, pressed collared white shirts and old worn blue jeans. If all the women dress similarly and all the men dress similarly then the photo has a more formal professional look. During cooler weather, hooded sweatshirts or otherwise that say Belmar or the Town you reside in can be fun as well. All white dresses for women and little girls and straw hats can add another dimension to this classic look. To make it different you can choose a pastel or light color instead of the white for shirts and tops like sky blue, light pink or pale creamy orange. The alternative to pastel for shirts is bright highly saturated colors like red, and pink. Another alternative is red or navy shirts and tops and white pants and shorts. Red is perfect if you intend to use one of the photos for a Christmas card. Another way to make this classic look a little different is if all of the men and boys wear a darker color on top, like a Denim shirt, or Navy or Black Polo shirts. Another alternative is for everyone to wear Blue Jeans instead of Khakis. Even if you never use hair spray or other products to hold hair in place, it is a good idea to use it before coming to the beach for the beach portrait. Even a small breeze can blow hair in front of eyes and cause people to keep moving their arms and hands to remove it. My advice is to use some before you arrive or bring it along in case you need it. Hair bands and ponytails are another good alternative. Due to glare and distortion, glasses should be removed during your session. Or, if you prefer to wear them, you may want to have the lenses removed. Small Children sometimes have a favorite beach toy that they like. It sometimes makes a great shot if they are allowed to hold it. Depending upon the child, it is sometimes the only way to get them to sit still for a shot. Older children may want to bring a surfboard or skim board, or some other favorite beach toy. It all adds to the personality of the shot. On request we can bring a large 10-foot Vintage surfboard that will hold a number of children for a sitting pose. On request we can bring a white Adirondack chair or several small wicker chairs as a prop or to assist those who may have difficulty sitting on the beach. 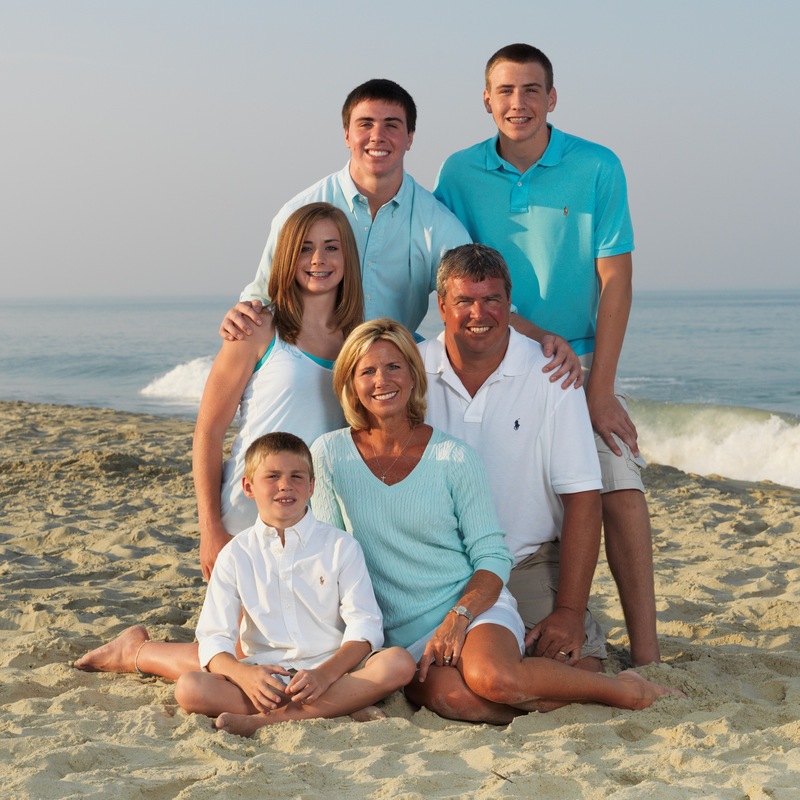 When shooting multiple families together – if you would like to differentiate each family, you can wear different color shirts. Women look best in v-neck and scoop neck tops. Short sleeve and sleeveless make this look very summery. Keep Jewelry simple. Men should wear shirts with either crew or polo open neck shirts. Avoid button down shirts unless they can be pressed crisply for a clean look and avoid pleated front pants as they are not flattering on most people. Short sleeve shirts look more summery than long sleeve shirts. Remove large dark colored watches. 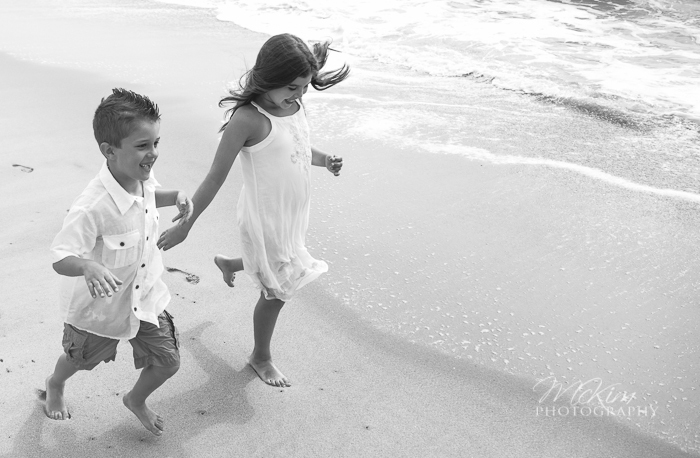 For summer portraits, we suggest everyone to be barefoot. This uniformity works best and also creates a more summery image. Sometimes after a storm in the summer there may be a cool breeze on the beach. If the weather is cool please bring sweatshirts and sweaters in colors that work well with the outfits that you have chosen. It is helpful if they are rested and fed before they arrive for the photo shoot. Please resist the urge to tell your child to smile or insist they be on their best behavior as this often backfires. Simply say “we are having our portrait taken and it will be fun.” We have photographed hundreds of children and assure you this is the best way. It’s helpful to bring a few items the child enjoys to the shoot. We can work with dogs, but would like the owners to have realistic expectations about how much time a real pet portrait takes. The activity of a lot of people moving about around the dog on the beach is usually to distracting to get the dog to sit still and look in the direction of the photographer for very long. Please come prepared to enjoy the process and have fun with your families making wonderful LBI memories that will last for a lifetime!